Green spaghetti! Homemade. Raw. And… did I mention green? Greenified? All right, I have some Wicked songs stuck to my head. The musical. 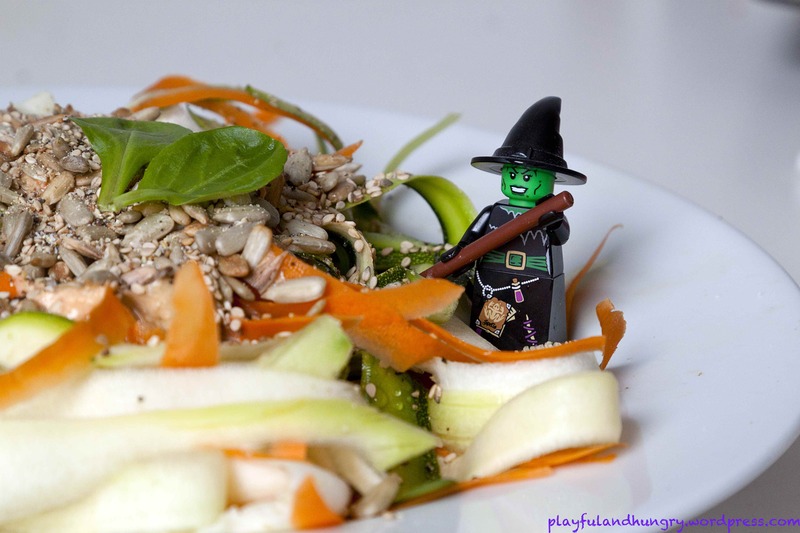 “Defying Gravity!” But I gonna have some noodles first! I know, the idea to make zucchini noodles is not new. What you need to know: you don’t need a special spiral vegetable cutter. A simple potato peeler will do the job. And it’s much less expensive! That’s it. Just peel them with the potato peeler. And don’t stop until nothing is left anymore. Mix one or two hand Cashews in your food processor. Add one or two dried tomatoes, a dash of salt and some pepper. Stir in some herbs, like basil, thyme and oregano. Mix one or two tbs native olive oil with salt, pepper, half a squeezed clove of garlic and herbs like basil and oregano. Mix one avocado with some lime or lemon juice, salt, pepper and (optional) some granulated garlic. If you don’t necessary what it raw, you could also mix some vegan cream cheese with hot water! 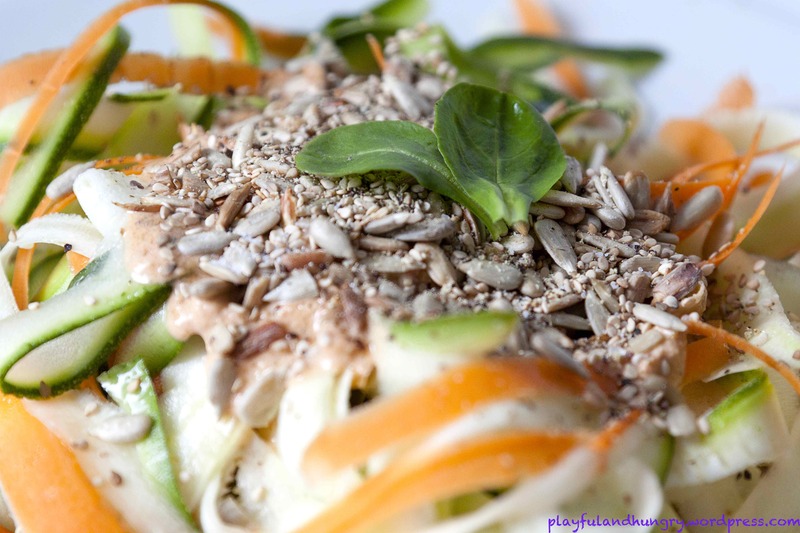 Put seeds like sesame, hemp, sunflower, pumpkin (…) on top of your spaghetti! You could also add some nutritional yeast, it will taste like parmesan! 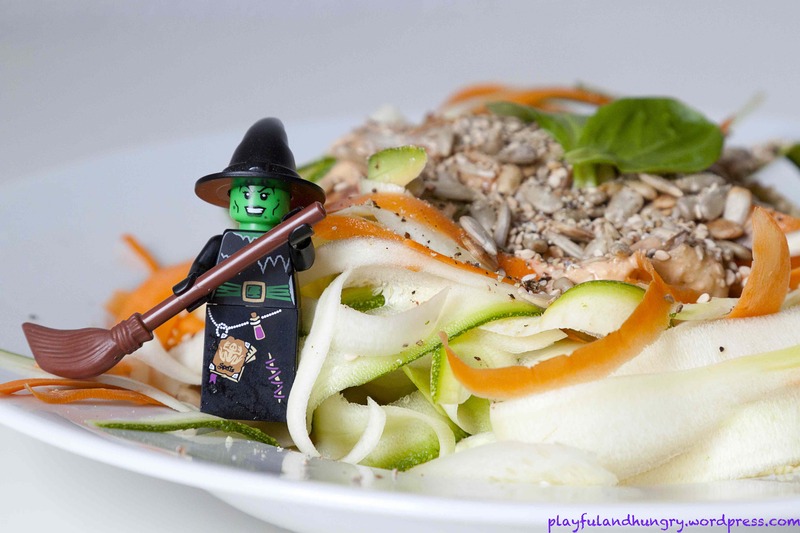 Love the recipe and the minifig! I love zucchini pasta. I think I will try topping mine off with an avocado sauce. Perfect for summer! Thank you! It’s amazing how different zucchini taste when you cut then into noodles and give them a great topping!